NEW LIFE! NEW SELF! NEW ME! Our old sins, old weaknesses, old bad habits are part of our old selves. If they are still part of us now. Then there is new life to talk about. But let us suppose that during the Season of Lent, we had made a good confession, a good reflection and good resolutions of a new self to welcome Easter. Old selves are our tomb. Can we step out of our tombs? Do we need assistance to roll away the stone? Who will roll away your tomb stone? It is not always easy to recognize the risen Lord! We are given the signs but we do not pay much attention to them. We have the Word and the Eucharist as signs of God’s presence among others. For example, do we really recognize Jesus in the Eucharist? Or does He vanish when we leave the Church? Or do we continue to live the usual routine of the day as if Jesus is not there? Do we find time to read the Word, reflect on God’s message, and live it? People do not need preachers, they need witnesses who can share their faith! The Lord has a mission for each one of us. We need time to be quiet and listen to His Word and message. We are busy with livelihood and a lot of things that use up a lot of our time and energy. We need to try our best and exert effort to cooperate with God. Ours is the human effort and God’s is the divine grace. In Scripture, we read the text and reflect on our lives as the context. Let our lives become the text and the Scripture as the context. 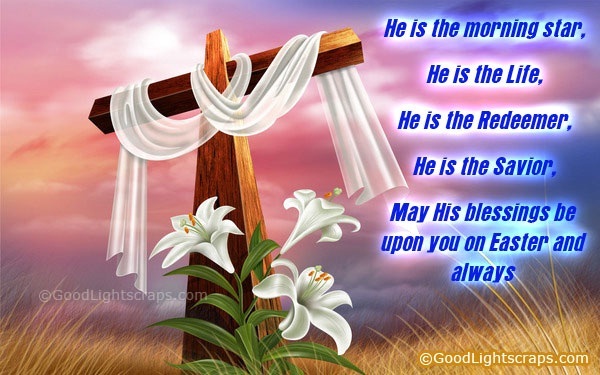 Then Easter becomes a reality in our lives! Do we need to see to believe? How come we do not yet understand? How deep is our faith to believe and not see? To believe in the unknown? To believe in God’s Word? I tried to empty myself from everything: achievements, success, prestige, honor, pride, position, power, and all material things painstakingly accumulated through the years. And yes, even my dearly beloved ones: family and friends. What are left? The life that God gifted me and the love He gave me and what I received and shared with others. And most of all my Faith in God. I have always believed in a God of love, mercy and compassion. I believe in a God who does not count my wrongs but is happy with all that I do right. I believe in a God who is ever patient to wait for my growth. Once upon a time, Jesus told me “you are still young; when you grow up, you will understand.” I have grown in age and understood many things. And yet, there is still so much to understand. Please Lord, help me to grow in faith and understand more. I know that on the last day of my life on earth, I have to leave everything earthly behind. I can only hold on to my spirit and all the spiritual treasures I received from God and the people who made my life meaningful with a purpose. And when that time comes, don’t look for me in my tomb. It will be an empty tomb. As Jesus has risen, so I will rise with Him. Alleluia!! Thank you Lord for saving me! Thank you for saving us all! Thank you for your love, mercy and compassion! For now, I am very much alive and happy with life! In spite of my asthma attacks, broken spine, muscular spasms, bleeding ulcers, heartburns and refluxes, I have survived with the help of my patient Doctors and friends. I have befriended my pains. I continue my work joyfully and do them as if nothing happened. But I have to accept my limitations now. My body is ageing and my ailments are reminding me of that. There is still so much to be done. I have hope and trust that the good Lord will allow me to continue my work. Easter is victory over death! Easter is new life! Easter is hope! Easter is joy! and make us instruments of his Peace. friends and those in need. to prepare is to prepare ourselves. in ourselves for his birthday? that we can offer to Jesus? especially to our own family and community. WE wish you the graces and inspiration of Advent! A blessed Advent to one and all!